Response: Hypoglycemia can acutely disrupt patients’ lives through symptoms ranging from bothersome to life-threatening; worsen quality of life; and hinder medication adherence and glycemic control. Hypoglycemia is now known to increase risk of mortality, cognitive impairment, and cardiovascular events. In order to improve the quality of diabetes care, healthcare organizations use publicly reported performance measures for quality measurement and improvement, and pay-for-performance initiatives. The degree to which existing performance measures are aligned with guidelines, particularly in regard to hypoglycemia avoidance, is uncertain. Dr. Mielke: Using a population-based sample of cognitively normal individuals, aged 70-89 at baseline, we found that a medical-record confirmed diagnosis of COPD was associated with an increased risk of mild cognitive impairment, specifically non-amnestic mild cognitive impairment. The risk of mild cognitive impairment increased with a longer duration of COPD such that individuals who had COPD for more than 5 years had a 2.5-fold increased risk of developing non-amnestic mild cognitive impairment. Hypothyroidism and Mild Cognitive Impairment Risk? Dr. Parsaik: Main findings of our study are that clinical and subclinical hypothyroidism is not associated with mild cognitive impairment in an elderly population after accounting for possible confounding factors and interactions. Dr. Ronald C. Petersen M.D., Ph.D.
Dr. Petersen: The diagnosis of mild cognitive impairment increases the likelihood of developing dementia. Answer: In our study, postmenopausal women who reported higher consumption of sugar-sweetened beverages were more likely to develop estrogen-dependent type I endometrial cancer, the most common type of this cancer. MedicalResearch.com: What are the main findings of the studies? Dr. Savica: This study is the first in North America to explore the incidence of DLB and PDD in a population based sample. We found that the overall incidence of dementia with Lewy bodies (DLB), considered the second leading cause of neurodegenerative dementia after Alzheimer`s disease, is lower than that of Parkinson`s disease (PD), increases steeply with age, and is markedly higher in men than in women. MedicalResearch.com Interview with: Rakesh M. Suri MD, D.Phil. MedicalResearch.com: What might clinicians “take home” from this study? a. The contemporary outcomes of surgical correction of mitral regurgitation are excellent based upon results observed in this large multinational, multi-institutional study, Mitral valve surgery now has a low peri-operative risk of death or complications, and a very high likelihood of saving a patient’s own heart valve (>90% – repair); thereby avoiding the need for replacement with an artificial valve substitute. b. All patients with severe degenerative mitral regurgitation are at risk for heart failure and/or death when surgical correction is delayed. A safe period of “watchful waiting” in those with severe mitral regurgitation due to flail leaflets, even in the absence of traditional Class I triggers for surgery (symptoms or left ventricular dilation/dysfunction) does not exist. What did you set out to find, what was your objective in this study? We wanted to know physicians perceived roles and responsibilities in addressing health care costs as well as their enthusiasm for proposed strategies to contain health care spending. Who did you study and what did you look at? Practicing US physicians under age 65, we randomly selected 3900 physicians representing all specialties and mailed them an 8-page survey entitled “Physicians, Health Care Costs, and Society.” We received 2,556 completed surveys (65% response rate). National Institutes of Health, 10 Center Dr 10/12N226, Bethesda, MD20892. Dr. Prasad: We reviewed all original articles in the New England Journal of Medicine over ten years. 1344 articles tested some medical practice– which is a screening or diagnostic test, medication, procedure or surgery. Only 27% or 363 articles tested current medical practice. And of these articles 146 (40%) contradicted current standard of care, constituting a medical reversal. MedicalResearch.com: Why did you do the study? Dr. Glazebrook: We felt CT was being underutilized for evaluation of knee injuries. The utility of CT has been well documented in the assessment of fractures, but little attention has been made on soft tissue evaluation. CT now has high spatial resolution with very thin reconstructions in any desirable plane, and we have previously noted that this allowed injured soft tissue structures such as cruciate ligaments to be well visualized [presented at Society of Skeletal Radiology meeting March 2013]. We had determined in that prior study that the best reconstruction plane to evaluate both normal and torn anterior cruciate ligaments was the oblique sagittal plane parallel to the lateral femoral condyle as routinely used in MRI imaging of the knee The soft tissue window, single energy bone removal and Dual energy bone removal were the best reconstructions to determine the presence or absence of ACL disruption The bone removal techniques removed the distracting bone so the soft tissue structures were more apparent. Newswise — April 11 2012— Mayo Clinic in Florida will be one of the first health care institutions in the United States to offer a newly approved device to treat gastroesophageal reflux disease (GERD). The condition, also known as acid reflux disease, can lead to serious health problems. The U.S. Food and Drug Administration (FDA) approved the device and treatment procedure on March 22 for patients with GERD who continue to have chronic reflux symptoms despite taking medication. 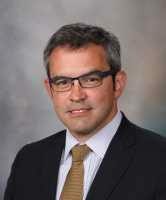 Mayo Clinic in Florida expects to offer the new treatment immediately, says C. Daniel Smith, M.D., chair of the Surgery Department at Mayo Clinic in Florida, and an internationally recognized expert on the treatment of GERD. Dr. Smith is experienced in using the system because Mayo Clinic in Florida was one of only 14 centers nationally that participated in a clinical trial that led to the FDA’s approval of the device. “Mayo has been a leader in the treatment of esophageal diseases, especially GERD, and we are pleased to be offering this new treatment to our patients immediately,” he says. GERD is a condition in which liquid, or food, in the stomach flows back up into the esophagus due to the inability of a ring of muscle between the lower esophagus and the top of the stomach to close properly. If drugs aimed at neutralizing the acid in the stomach fails to prevent GERD, an operation designed to correct the mechanical defect is considered. But between 1.5 million and 2 million patients of those patients could benefit from treatment that is much less complex than current surgical options, Dr. Smith says. “The new system will offer a long-needed treatment option for a large group of underserved patients,” he says. The implanted device is a ring of tiny magnetic titanium beads that is wrapped around the junction between the stomach and esophagus, serving as a mechanical augmentation of the lower esophageal sphincter (the ring of muscle). The magnetic attraction between the beads is strong enough to keep the sphincter closed to refluxing acid, but weak enough so that food can pass through it into the stomach, Dr. Smith says. The device can be implanted using minimally invasive surgery methods. Dr. Smith performs about 200 GERD-related surgeries a year and has been involved with many new treatments over the past several decades. “I expect this device to be a game changer for the treatment of GERD in select patients who have failed management with drugs,” says Dr. Smith. Mayo Clinic physicians and scientists collaborated with Torax Medical in the development of this technology and Mayo Clinic licensed related technology to the company in exchange for equity. Drs. DeVault and Smith are paid consultants to Torax Medical. SAN ANTONIO — Obese patients with early-stage HER2-positive breast cancer may have worse outcomes than patients who are normal weight or overweight, Mayo Clinic researchers found in a study presented today at the 2011 CTRC-AACR San Antonio Breast Cancer Symposium. HER2-positive breast cancer gets its name from a protein called human epidermal growth factor receptor 2 that promotes cancer cell growth. In a review of data from 3,017 patients, researchers found that, considering all three treatment arms together, obese patients — those with a body mass index (BMI) of 30 or more — had worse outcomes than patients with a BMI less than 30, although these trends were not statistically significant. Frontotemporal dementia and amyotrophic lateral sclerosis, also known as Lou Gehrig’s disease — two fatal neurodegenerative disease with distinct symptoms — are triggered by a common mutation in many cases, according to researchers who say they have identified the mutated gene. In the study, reported in the September 21 online issue of Neuron, the scientists described the discovery of a genetic mutation that is accountable for almost 12 percent of familial FTD and more than 22 percent of familial ALS samples studied. They also report that the defect is the strongest genetic risk factor found to date for the more common, non-inherited, sporadic forms of these diseases. It was found in 3 percent of sporadic FTD and 4 percent of sporadic ALS samples in the largest clinical patient series. The study was led by scientists at the Mayo Clinic in Florida, in collaboration with researchers at UCSF, the University of British Columbia and UCLA. The finding emerged from the identification and study of a family stricken by both ALS and FTD, reported last year. In that study, led by the UCSF scientists and published in the Journal of Neurology, Neurosurgery and Psychiatry, the researchers honed in on the region in which the gene was located. “Both clinically and at the molecular level this discovery is going to significantly improve our understanding of these diseases,” said co-author Adam Boxer, MD, PhD, of the UCSF Memory and Aging Center, the lead author on the 2010 paper. The discovery makes it possible to develop a diagnostic test for the mutation, as well as to create animal models that may be used to help unravel the molecular mysteries connecting the mutation to the diseases, he said. In the current study, a detailed molecular genetic characterization of the family that Boxer described was done in the laboratory of senior author Rosa Rademakers, PhD, from the Mayo Clinic. She and colleagues identified the gene and the specific mutation within it. The mutation consists of from hundreds to thousands of extra copies of a six-letter DNA sequence GGGGCC strung end to end within a region of human chromosome nine. The mutation occurs within a gene of unknown function called C9ORF72. After identifying the mutation, the Mayo researchers searched for it in DNA from other patients with both familial and sporadic forms of the diseases, where they found the strong associations. FTD is characterized by disturbances in decision making, language skills, behavior and emotional expression, and is as common as Alzheimer’s disease in people younger than 65, according to Boxer. ALS is a neuromuscular disease, leading to muscle paralysis and respiratory failure, often within three to five years. However, it is not unusual for patients diagnosed with one of the two diseases to exhibit symptoms of the other. Since 2006, six separate groups have reported evidence for a genetic link between the disorders and the same chromosomal region. In the study led by Boxer last year, the researchers described clinical aspects of the disease within the family, and homed in more closely to the gene than others had. The pattern of protein deposition in the brains of family members in the study may eventually shed light on common aspects of the neurodegenerative process that occurs in both diseases, Boxer said. There is only one standard medical treatment for ALS, riluzole, which extend life for about six months, he said. There is no known effective treatment to slow FTD. However, neurologists have generally become much better at recognizing the degenerative disorder, according to Boxer. Boxer and Bruce Miller, MD, the director of the UCSF Memory and Aging Center and a co-author of both studies, are leaders in FTD research, diagnosis and patient care. “Ten years ago some neurologists did not acknowledge the existence of FTD,” Boxer says. “Today we are much better at diagnosing the disease, although sometimes it still takes an expert to distinguish it from Alzheimer’s or from psychiatric disorders. The researchers used a technique called linkage analysis to narrow the search for the gene by comparing affected and unaffected family members. Another group of scientists — reporting in the same online edition of Neuron on the same gene — found that C9ORF72 emerged as being significantly associated with FTD and ALS in a genome-wide scan of patients in Finland. The Mayo portion of the study was funded by the National Institutes of Health and the ALS association (ALSA). The UCSF portion was funded by the NIH, the John Douglas French Foundation; the Hellman Family Foundation and the Tau Research Consortium and the Larry Hillblom Foundation and the state of California. ROCHESTER, Minn. – Any exercise that gets the heart pumping may reduce the risk of dementia and slow the condition’s progression once it starts, reported a Mayo Clinic study published this month in Mayo Clinic Proceedings. Researchers examined the role of aerobic exercise in preserving cognitive abilities and concluded that it should not be overlooked as an important therapy against dementia. The researchers broadly defined exercise as enough aerobic physical activity to raise the heart rate and increase the body’s need for oxygen. Examples include walking, gym workouts and activities at home such as shoveling snow or raking leaves. “We culled through all the scientific literature we could find on the subject of exercise and cognition, including animal studies and observational studies, reviewing over 1,600 papers, with 130 bearing directly on this issue. We attempted to put together a balanced view of the subject,” says J. Eric Ahlskog, M.D., Ph.D., a neurologist at Mayo Clinic. “We concluded that you can make a very compelling argument for exercise as a disease-modifying strategy to prevent dementia and mild cognitive impairment, and for favorably modifying these processes once they have developed.” The researchers note that brain imaging studies have consistently revealed objective evidence of favorable effects of exercise on human brain integrity. Also, they note, animal research has shown that exercise generates trophic factors that improve brain functioning, plus exercise facilitates brain connections (neuroplasticity). Co-authors include Yonas Geda, M.D. ; Neill Graff-Radford, M.D. ; and Ronald Petersen, Ph.D., M.D.